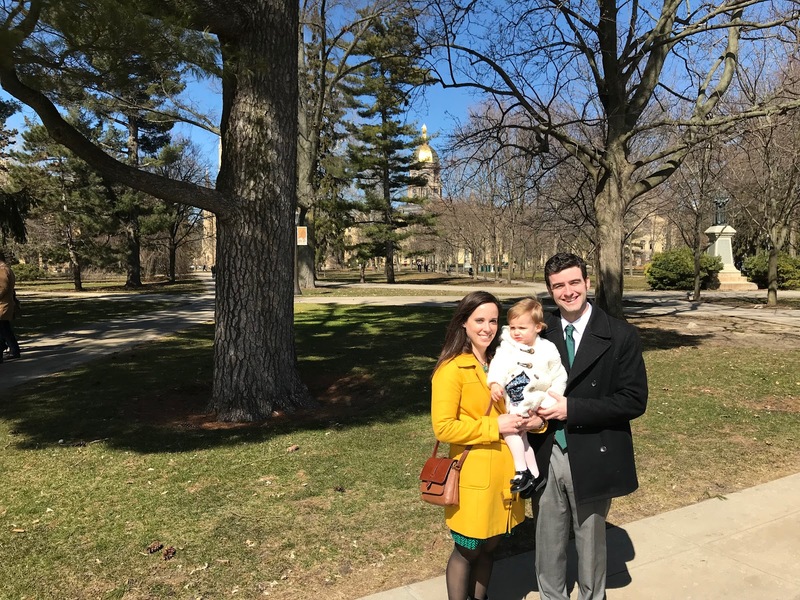 I think the Maid of Honor said it best during her speech this weekend: "There are two great places to spend St. Patrick's Day. The first is Ireland. The second is the University of Notre Dame!" Dan and I had been looking forward to this weekend since the save-the-date arrived from my friend Erin and her fiancé Matt several months ago. Friday afternoon, we dropped Mae off with Grandma and Grandpa. They brought Mae along with them on Saturday morning, so Dan and I had a whole evening to ourselves. We met Julie and Dave for dinner before heading to campus for the beginning of the wedding festivities: a welcome party at a venue called Seven on 9 in the new stadium building, which had superb views of the football field. After a quick lunch in the room, we walked to the Basilica for the wedding. Believe it or not, this was my first time to attend a wedding at Notre Dame! The ceremony was beautiful (as expected), and Mae was mostly well behaved (a pleasant surprise). I kept her occupied with M&Ms for a while until she wanted to wander, and Grandma took her to the back of the church. There she tried to eat a half-eaten red M&M from the floor. Grandma quickly snatched it away, just before realizing it was actually a live ladybug. Good catch, Grandma! From the church, we walked to the steps of the main building for a group photo. A bagpiper entertained us while we waited for the wedding party and photographer to join us. Mae LOVED the bagpiper. Every time he stopped playing, she asked "Mo'? Mo'? Mo' bagpipe??" Kelsey returned from her spring break just in time to babysit Mae for the evening! They enjoyed a walk around campus and some room-service pizza while Dan, Mom, Dad, and I danced our little hearts out at the reception. I had so much fun spending time with my high school friends, especially the ones who are scattered to further parts of the country! Sunday morning, we enjoyed a quick brunch with my friends in the hotel before driving back home. Can't wait to see everyone again soon!